Sat barefoot in jeans and a loose shirt in the corner of Mt Pleasant’s Dog and Duck, local musician Thomas Champagne could easily trick you into thinking you were somewhere else. 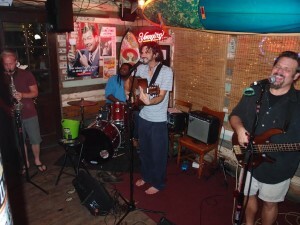 His unique acoustic style and unusual syncopation fuses a myriad of genres, from his country and Cajun roots to reggae and Caribbean influences. Champagne achieves this with ease so when he segues into an original song it’s often overlooked because his sets flow seamlessly together. However, this didn’t come naturally to Champagne when he first arrived in Charleston from Austin, Texas. It was a challenge he says he had to grow into and work hard at developing. For me it evoked the great Aussie legacy of pub rock offered any weekend night in a beachside bar on the Indian Ocean in Perth, or a St Kilda pub in Melbourne. Continuing this prominent theme of evolution is the rotation of local musicians Champagne uses at every show. 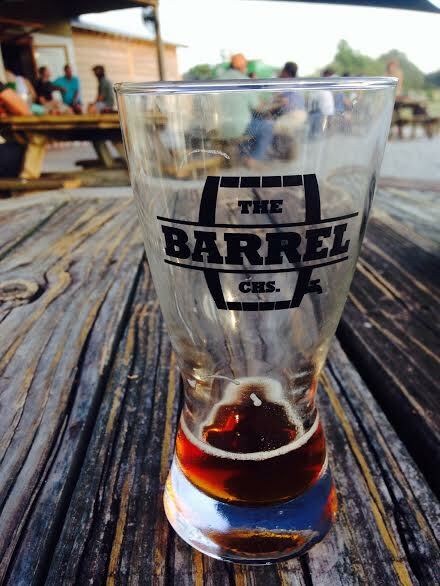 There is some buzz going around James Island, between Walmart and Folly Beach and that is the new craft beer watering hole, The Barrel. Built from the ground up, many locals have been keeping an eye on this plot of land from dirt to roof anticipating its opening. It does not disappoint. With a lavishly open back yard, tailored for the grass sports fan, this meeting place offers shuffleboard, corn hole, open roaming for dogs and a caged dog area with a pool for the not-so-friendly canines. There are plenty of patio tables and covered areas complete with shower fans during the warm months to ease patrons from the strains of the heat. Some of the participants in the Food Truck partnership are: Cilantro’s, Smoke, Roti Rolls, Run Around Sue’s and Zombie Bob’s. The inside is cozy with dark wood paneling, a “z” shaped bar top, an outdoor bar area with an inward view, a few chairs against the wall and a sizable community table. The menu is a feast for the craft beer lover. Heavily focused on local Southeast brewers with a nice added list of national micro brews, The Barrel offers everything from the white blond taste bud to the deep lager moustache wearing manly man. This is a beer fan haven compartmentalized into an intimate setting. Most of the patrons come inside for a little shelter from the heat, but spend alot of their time outside feeling as if they are in their own backyards. There is limited parking, but plenty of street parking off of Folly Road. Whether you are looking for a 4.9% alcohol content beer or a 9.5% high gravity, they have you covered. There are 34 beers on tap to meet every drinkers needs. This is a place to go with friends. Bring your beer palate, enjoy a little shuffleboard and let the dogs roam free. From the surfers, to the lumberjacks, The Barrel delivers one pint at a time. Katherine DuPre represents a noticeable and enviable trend in Charleston – people who are passionate about what they do and love their work. 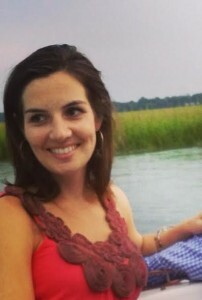 She currently works with a local hospice while completing a Master of Social Work from College of Charleston. Katherine describes her family and friends as a major influence in her desire to work in palliative health care. 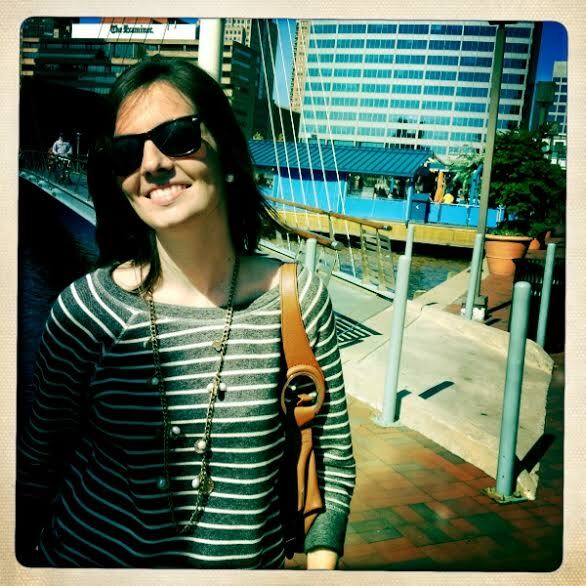 However, Katherine’s journey into social work was an unorthodox one involving a three am epiphany while working in the nation’s capital as a local television journalist. Previously majoring in journalism from College of Charleston, Katherine spent six years carving out a successful career in print and television news both locally and in Washington DC. Katherine attributes her attraction to hospice work to her passion for hearing stories firsthand. While providing social support to people who need it most, she listens to the stories of veterans who have been through life’s hardest challenges. Katherine sees her journalistic background ideally suited to preserving the stories of people who have no one else to tell them to, and at the same time hopes to change the stigma of hospice in South Carolina. The modesty and dedication of palliative health care workers are a regular source of inspiration in our local community. So it’s not surprising that while facing these challenges in a new career as a social worker, Katherine says she feels almost selfish for wanting to do this work because she loves it so much. As the seasons change, so do our diet and exercise routines. The weather may feel like a barrier to exercise and our food choices may be enriched with holiday indulgences. It is not uncommon to gain a few pounds during the colder months. 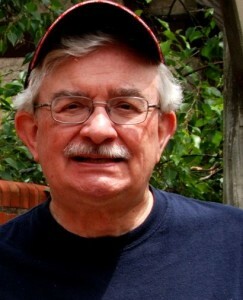 The Charleston Daily asks Dr. Jay, how can Charlestonians maintain those svelte summer physiques? Here are her suggestions, with research to back them up. 1. Start the day with a goal for being healthy. 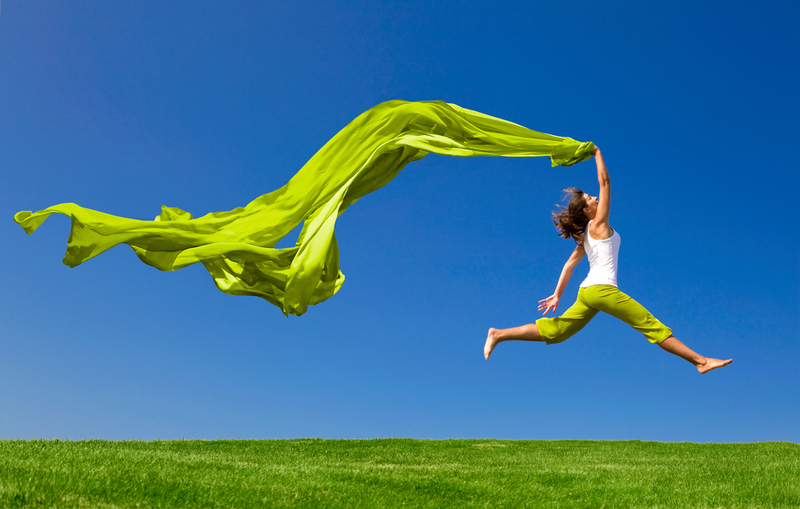 There is evidence that when individuals think about exercise, it helps them meet their goals . Whether it is visualizing yourself at the top of the Cooper River Bridge or playing fetch with your dog at James Island County Park, take one of the 24 hours in your day and make it about you. 2. Park a little out of the way. This is not hard at all if you are going somewhere downtown. Having dinner at the Macintosh, you may have to park by the Warehouse. In your neighborhood, try parking on the other side of the grocery store parking lot. This built in space forces you to walk, thus improving cardiovascular health . 3. Be romantic and share dinner. Food sharing is a great way to cut calories and to foster relationships. This active area of research  can be utilized by best friends, lovers or spouses – anyone you don’t mind getting cozy with. Go to your favorite casual restaurant, sit on the same side of the table and split a dish. Table manners be darned. This may not be appreciated at Peninsula or Charleston Place (actually it may-service is exceptional at both restaurants). I recently shared a great bowl of pho this way (caveat- my dining companion and I now have the same cold). 4. Pack your lunch. I know it can be hard to resist the loaded baked potato bar at the ART cafeteria, but last night’s leftovers or a homemade salad would be better for you. A recent article proved that a healthy packed lunch can decrease a marker of liver inflammation . Have a sweet coworker with home-baked banana bread? Just savor the taste of one bite. Don’t worry, someone brought a batch of holiday cookies in from Sugar for your third afternoon snack. 5. Eat real. Many of my friends and patients tell me that it’s okay to have two scoops of ice cream or sugar-free holiday goodies. The fact is, the sugar-free treats are loaded with non-digestible sugar alcohols. The sugar alcohols can make IBS flare  and there you are in the waiting room, waiting for an appointment with moi (and sorry, I’m running late.) If you are not diabetic, consider having some real ice cream or pie but opt for the kids-size portion. Lebon F, Collet C, Guillot A. Benefits of motor imagery training on muscle strength. J Strength Cond Res. 2010 Jun;24(6):1680-7. Iwamoto M, Yagi K, Yazumi K, Komine A, Shirouchi B, Sato M. Eating a healthy lunch improves serum alanine aminotransferase activity. Lipids Health Dis. 2013 Sep 14;12:134. I squealed with delight when I discovered Charleston Donuts by accident. I was on my way to an office supply store in the Wando Crossing Shopping Center and while I didn’t plan to eat donuts that day, I embraced the opportunity. Nestled in a corner of the strip mall, this family-owned donut shop is easy to overlook. I was greeted by an incredible aroma and several enthusiastic employees who explained the protocol. Pick a donut, pick a glaze or frosting and choose your toppings. The decorators will then create your custom donut while you watch. I debated within my head. Should I choose cream cheese frosting with bacon? Chocolate frosting with coconut and almonds? Vanilla frosting with mini M&Ms? 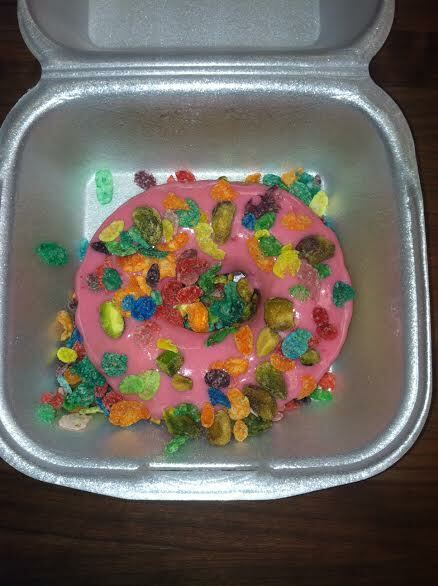 I settled on strawberry frosting, sprinkled with Fruity Pebbles and pistachios. Before I could even pay for it, it was ready. It took incredible restraint to take the photos for this article and not dive right in. It was… the best donut I have ever had. The outside was crispy and the inside was cakey but still fluffy. And it was served piping hot. The gooey berry frosting and crunchy toppings were perfectly complimentary. I had only planned on having one donut but found myself back at the register ordering another one. They took my old standby, chocolate frosting with rainbow sprinkles, to a new level. The chocolate frosting was dark and rich. What a decadent treat. This time I also ordered a cup of coffee and it was very good. 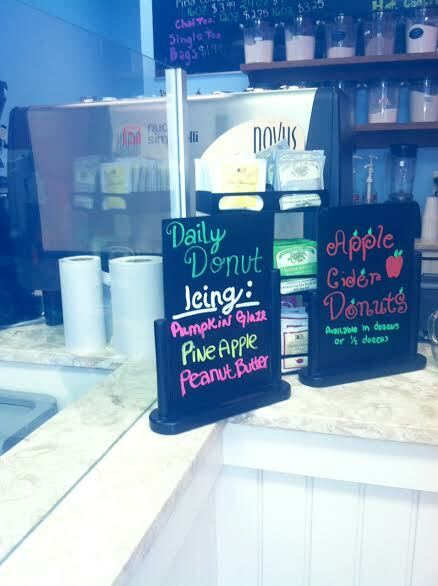 They have other donut choices beside the white cake type such as a seasonal apple cider donut. They also accept suggestions for novel donut toppings. Anyone up for cinnamon toast crunch? For breakfast or a sweet snack this is a great local option. Need dessert for the potluck dinner party? This would be perfect. Need to apologize to someone? Donuts trump flowers every time. Birthday celebration? Arrive with a dozen custom donuts and be the life of the party. Charleston Donut is open daily from 6:30am to 2:30pm and can be found online at http://www.charlestondonuts.com. From the first turn onto Folly Road to the ocean, we drive past dozens of delicious restaurants. Veering off at one of the side streets is where we find the local treasures. These are the places where we won’t bump into tourists, because these spots aren’t on the direct path to the beach. The newest addition to this small list of restaurants is Rollin’ South Kitchen. Rollin South’ just opened up a short two weeks ago in the building that was formerly The Sloppy Cow. With a fresh paint job on the outside and an open and welcoming interior, this new diner has been bringing in crowds from all corners of James Island and the peninsula. Their lunch menu starts with Jim Island Snacks, which includes traditional comfort foods like Chuck Town Chips and Folly Fries, and then progresses through salads, hot sandwiches, cold sandwiches, and options from the grill. The interior is decorated in our Charleston beach fashion, with comical life lessons painted on old wooden planks, and the dishes have witty names like the Fatty Patty Melt, Bubba’s Bacon, and the Reuben You The Right Way. Considering that they’ve only been open for such a short time, the staff were very knowledgeable about the menu. They were able to point out and explain their favorites from each category of food on the menu. 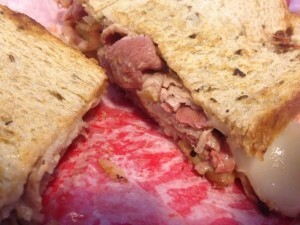 The Reuben You The Right Way got the highest recommendation, and I opted to go with pastrami over the corned beef at the managers suggestion. The name fits. The pastrami was tender and juicy, and it brought a pleasant bit of spice to the sandwich without over powering the other ingredients. The tartness of the sauerkraut paired wonderfully with the kick of the pastrami, and the melted swiss cheese worked well at everything together. Thousand Island dressing brought that familiar zest while the toasted rye kept all the flavor of the pastrami from escaping. 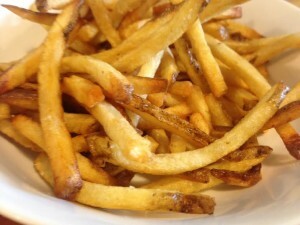 The fries are done just right here as well. They cut them in house and fry them to perfection, leaving them with a crispy golden outside and flaky white inside. If malt vinegar is your thing, they’ve got you covered here. If not, you can’t go wrong with ketchup. The portions were perfect. I was completely content after cleaning my plate, but I was so satisfied with my lunch that I couldn’t help but to ask about dessert. My server said that the key lime pie is her favorite, and she hadn’t led me astray thus far. 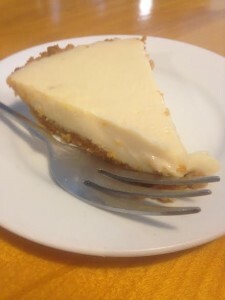 I love key lime pie because of the pairing between the tartness of the lime and the sweetness of the graham cracker crust, and this pie fits the bill. Just when you are about to pucker up from the sour filling, the sweet crust balances out each bite. With their welcoming and hospitable staff and the delicious food options, Rollin’ South Kitchen has kept their tables full since the day they opened. 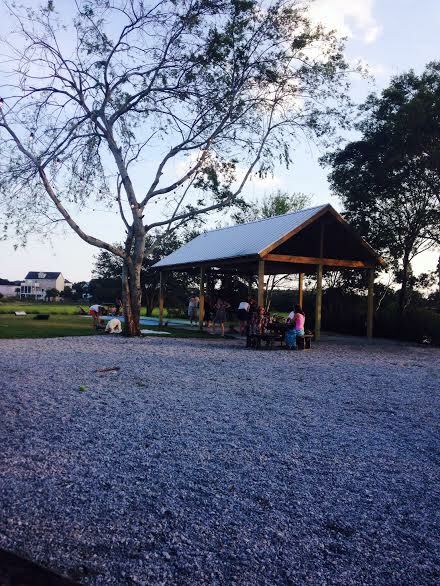 It looks like the newest addition to the James Island food scene is here to stay. The Doctor is IN. Welcome to Healthy Charleston. Honestly, I ask myself that question daily. The fact is most doctors have about 2 hours of formal nutrition training in medical school – and most of my colleagues cut class or slept through those lectures. Throughout my internship, residency and fellowship, I have had to self teach myself everything that I know about exercise and proper nutrition. I still have many unanswered questions. Should I run up or down the Ravenel Bridge? Are calories the only thing that matter? Should I graze or eat big? 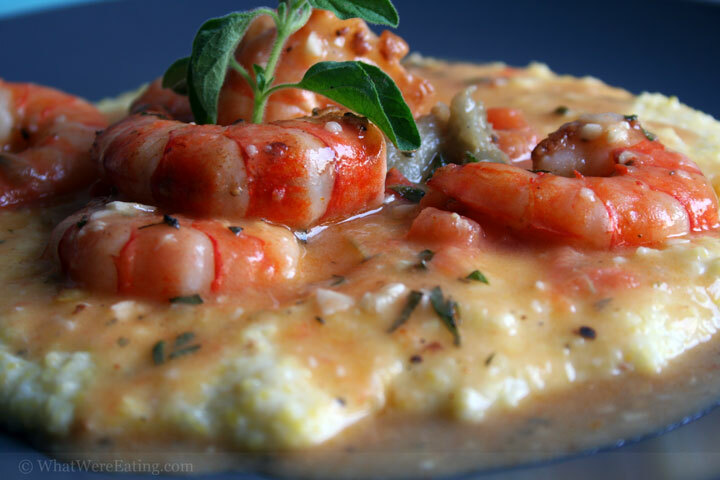 Are grits really good for me? Are synthetic sugars safe? What is a safe amount of alcohol consumption? Should bacon be banned? Is running or walking better? Over the next several months, I will tackle these topics and more in this column. That brings me to our first big question: Does the place where we live and work make a difference in our overall health? Without any hesitation, I say yes! During my internship and residency in NYC, I found that no matter what I did, I was not optimizing a healthy lifestyle as it is impossible there. The daily threat of getting hit by a car, molested on a subway platform and breathing toxic fumes cannot be denied. After years of the high stress living, returning to Charleston made perfect sense. Charleston is absolutely conducive to healthy living. The only proof one needs is to step outside and look around or check out the photography page at the Charleston Daily. The pristine marshes, majestic sunsets, and serene beaches combined with manageable traffic patterns, relatively low noise pollution and really polite neighbors, make for a backdrop of relaxation. The stress of the day will melt away, if we let it. So rest assured, just by living in Charleston, you are making a healthy choice compared to living elsewhere. The doctor is in and this time I’ll try to answer the eternal health conundrum: are grits really good for you? Coming from a hash-brown father and a polenta mother, grits were infrequently on our Missouri table. After moving to South Carolina, I tried my first taste of properly prepared grits at the late Anson Street Café. Those bites changed my world. The creamy, buttery warmth made me suddenly happy. There is solid medical evidence that happiness improves one’s sense of well-being and mental health. 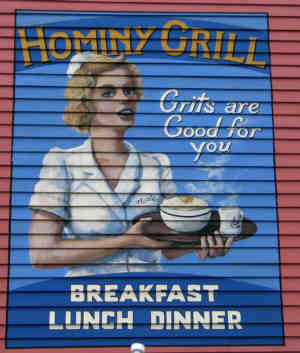 Logic follows that grits are, at least somewhat, good for you. However, the nutritional content of grits is relatively dismal. I will spare you the details of the individual packets of cheese- or butter-flavored instant grits. Don’t eat those. Ever. The word “instant” means place directly in a trash can. The two other types of grits found in grocery stores are quick grits and slow-cook grits. They are both available in canisters in the cereal aisle. Among the slow-cook grits are packages of stone-ground and heirloom varieties from purveyors such as Anson Mills and Adluh. These products have larger grit size, and for reasons I explain below, are healthier than fine grain quick or slow-cook grits. If you are familiar with the movie My Cousin Vinny, you know that, simply put, grits are corn. Corn is mostly carbohydrates. Carbohydrates are sugar. And sugar is bad, right? We are raised to believe sugar rots the teeth, causes obesity and contributes to diabetes. All true. However, carbohydrates are a ready source of energy for the brain. They can be used immediately by neurons and keep the brain mentally sharp unlike the slow release of energy that occurs while in ketosis, i.e. in a state of starvation or while on a low carbohydrate diet. What I am saying is, my patients are in better hands when I have grits for breakfast as opposed to a hard-boiled egg and sausage. Thus, grits are good for the mind. Finally, while calories matter, a phenomenon known as the Glycemic Index is important as well. 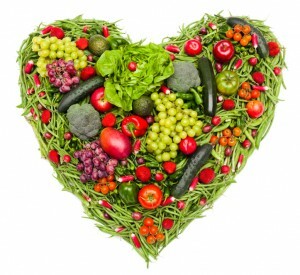 I have personally read and referred my patients to read the Glycemic Load Diet, by Cardiologist Dr. Rob Thompson. This diet plan has yielded great results in weight loss and diabetes management for many of my patients. The rationale is that the quicker carbohydrates are broken down from food into glucose, the faster and higher the resultant insulin spike is produced by the pancreas. High and fast insulin spikes leads to insulin resistance, heralding obesity and diabetes. The numerical value measuring the rate at which glucose is released from a food is called the Glycemic Index (GI). The higher the GI, the faster the blood glucose and insulin spike. The GI of pure sugar is 100. White bread is 99. Instant oatmeal is 83. Lettuce is 10. Any food above 69 is considered to have a high GI and should be avoided. Grits prepared with water has a GI of 69. Fortunately, it is known that the less food is processed and cooked, the lower the GI it retains. Thus the larger the grit size, the lower the GI making course, stone-ground grits preferable. Likewise, cooking foods with fat (i.e. butter and milk) lowers the GI as well. Finally, yellow corn is slighter lower in calories than white corn and thus preferred where health is concerned. It follows that yellow, stone-ground, slow-cook (less-processed) grits cooked with butter and milk have a lower GI than instant grits prepared with water making these more delicious grits relatively healthier. Make no mistake, they are loaded with calories (up to 300 calories per cup), but they have a moderate GI and they make us happy. That combination is good. Thus, grits are good for you. So help yourself to a modest helping at your next brunch and until we meet again, be well Charleston. Now tell me, does a turkey sandwich befit a restaurant week menu choice? Of course not, but that’s what the Mensch ordered from the Rutledge Cab Company’s regular menu last week. If I were a poet I would have written a sonnet, an ode, or a haiku to that turkey sandwich. Instead, I sent an email to general manager Dan Tolbert praising their turkey sandwich. Who knew that toasted white bread could be so good? Thick cut, crispy brown outside, chewy inside. This wasn’t Wonder Bread. It was Pane De Vita bakery white according to Dan. And the turkey was just like the leftovers on black Friday, REAL turkey, not that deli-roll pretender. They roast it in house. Even the tomato was to die for. I think it was grown in a secret garden on John’s Island and not from Limehouse Produce as Dan offered. The best part of this lunch was that the Mensch got two meals on one check! And even one day later, the toast of the other half of my sandwich had almost held its own against the spread and the tomato. I could have done without the sprouts and the subsequent gas, but that’s not their fault. Who cares what the restaurant week specials were, the everyday menu was tops. With the unlimited budget at CharlestonDaily.net, restaurant week continued with dinner at 82 Queen which, after Magnolias, was a letdown. First off, the Mensch had to pay for parking, $3, at the city garage across the street. Again we were a few minutes early and were offered seating immediately. We followed a hostess up the iron stairs to a small room to our left. Unlike the linen-clothed table of Magnolias, there were place mats. Our server Sienna cleared the extra settings and presented menus and beverage lists. Another great selection of cocktails and wine. An old-fashion, or is it old-fashioned?, and a cosmopolitan please. The three course menu for $30 had some great choices. There were six appetizers, seven entrees and two desserts. For an extra $10 a crab cake would be added to any entree. Sienna recommended the she-crab soup and the crab cake. Unlike Magnolias, this room was not crowded and the ambiance left something to be desired. Mrs. Mensch opted for the she-crab soup and how could I refuse fried green tomatoes? I had hardly sipped my cocktail when our appetizers appeared. Mrs. Mensch oohed over the soup. The fried green tomatoes were tasty but not like they had been freshly prepared. The bed of cheddar grits were smooth, creamy and laced with bacon. Even Mrs. Mensch, a died-in-the-wool grits-hater, agreed with me and proceeded to glom some grits off my plate. (“Grits were” or “grits was” which is correct? Either way it won’t affect the taste.) Before the plates disappeared our bottle of Rodney Strong chardonnay was uncorked. A fine selection. Entrees appeared and Mrs Mensch had to send back the land portion of her land and sea. The steak was a little too rare for her. The scallop was sweet, a little cool and the outside sear was lacking in definition. The recommended crab cake was Maryland perfect. I know, I know, chardonnay with steak just doesn’t sound right. However there was a scallop and a crab cake on her plate and I had the cod. Three out of four tilted the odds for white wine. Speaking of cod, it was Atlantic and baked so that the muscles peeled off like so many nickels. There were other mussels on the plate. I embarrassed myself by asking what PEI meant for the mussels. Ah, Prince Edward Island. Who knew? Actually, I did know, but the gray matter could not conjure up the definition. I was on my fourth mussel when the wayward steak returned cooked to her liking. Now she had two plates of entrees side by side, scallop and crab cake on one and steak on the other. Neither of us could see the value in adding chocolate to cheesecake and we both chose the lemon cello spongecake with lemon frosting and shaved white chocolate. A great dessert. My disappointment was in the pacing. It was as if the kitchen knew what we would order, yes, yes, restaurant week menu, prepared it ahead of time and warmed it up to serve. We sat down a little before 6:30 and 7:31 was time stamped on my check. If I had hadn’t lingered to chat with the hostess or explore the other dining areas, I would have been home in time for Final Jeopardy and only paid $2 to park. There are some great eating and drinking experiences hidden on the side streets that criss-cross between Meeting St. and E. Bay St., but there is one that you might actually have to hunt down. I found it by mistake one day trying to circumnavigate a traffic delay. I cut down Line street, and I noticed two tables on the sidewalk and small sign fastened to the fence in front of what looked like any other house. The sign said Georgean’s Caribbean Soul, so I made a quick mental note to come back sometime. Well, I finally checked it out, and I was astounded. It’s hard to think of a restaurant that epitomizes the expression neighborhood restaurant better than Georgean’s Caribbean Soul. This quaint kitchen is nestled right in the middle of two houses on Line St., just across from a church. Oh yeah. Did I mention that they will deliver Sunday supper right to your church parking lot? I arrived a few minutes before they opened, but the co-owner Deborah welcomed me in early, commenting, “If you know I’m here, just knock and I’ll let you on in and take care of you.” Deborah is the co-owner with Chef Tim Jackson, who named the restaurant after his grandmother. Opening in January this year, the two work together to bring authentic Caribbean cuisine to the Charleston food scene. When I asked Tim how they wound up in this location, he replied, “There weren’t many restaurants in this neighborhood. There was a Church’s Chicken a few blocks down, but most other restaurants are too far away. We wanted to offer something closer to the surrounding neighborhoods.” What better way to do that than to open up shop right in the middle of the neighborhood? Aside from the two small picnic tables outside, Georgean’s is strictly take out. When you step inside the door, the only thing separating you from the kitchen is the front counter and a few feet of space to move around in. A small and fairly simple menu on the counter offers their various food options. This means you have a front row seat to watch your meal cooked from scratch. They don’t par-cook or reheat anything here. Everything is made to order from the freshest local ingredients available. This does mean that there will be a bit of a wait, but it’s worth it. The flagship menu options are definitely the jerk or curried chicken. 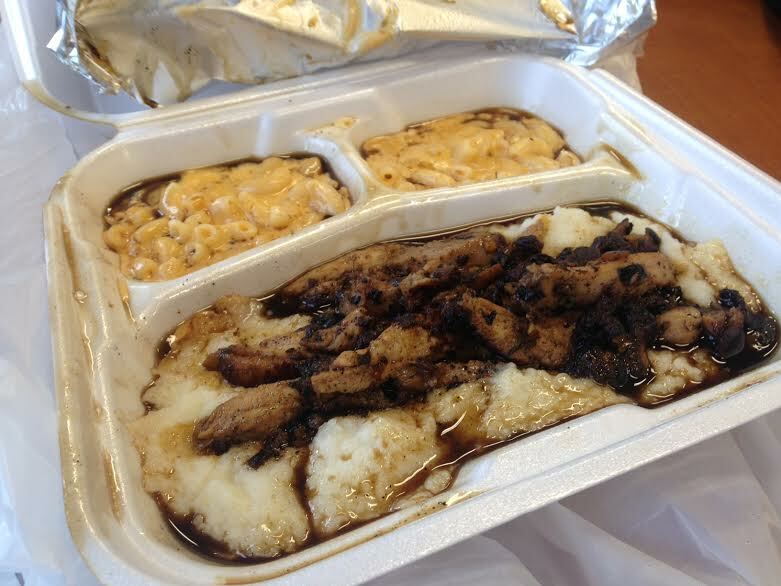 I opted to go with the jerk chicken with cauliflower mash and macaroni and cheese. It may not have looked like much, walking to my car with the styrofoam to-go box and sweet tea, but don’t be fooled. Let me tell you, that trip back to school felt like the longest five minute drive ever. The sweet and savory aroma quickly filled my car, and I found myself contemplating digging in on the drive back, but I waited… and waited… and nearly ran from my car to the break room and jumped into this Caribbean dream. I’m usually not one for skin-on chicken, but it didn’t slow me down one bit. In fact, I wish I had slowed down. Before I knew it, I was looking at an empty plate, gasping for air and wondering what the hell had just happened. I basically inhaled my lunch in a blur of spices and flavors that made up what was one of the top five best meals I’ve ever eaten. The jerk chicken had a delicately crisp skin and an oh-so-tender center that was bursting with flavors. These flavors come from the wet jerk seasoning that the sliced chicken breast is sautéed in. Notes of ginger, clove, nutmeg, allspice, and brown sugar shine though in every savory bite. 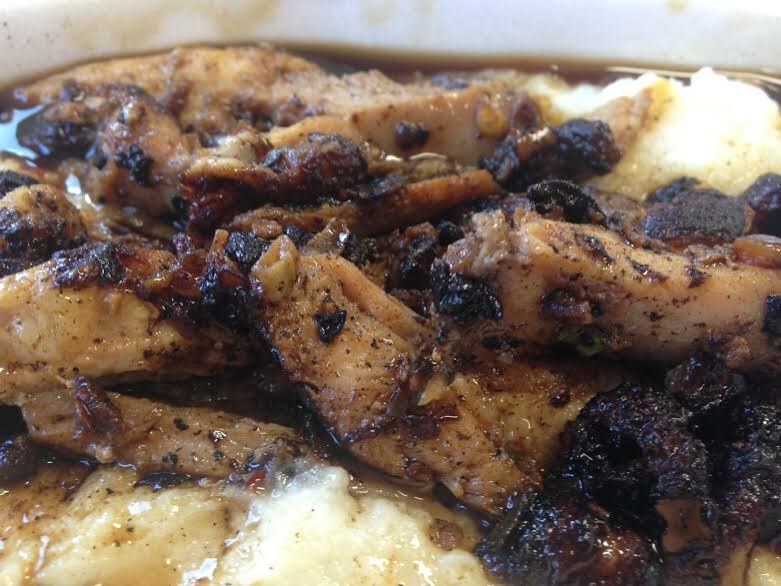 The farm raised, preservative free chicken was sliced and served over a bed of creamy cauliflower mash. After I finished the chicken, the cauliflower worked perfectly for mopping up the juices left behind. 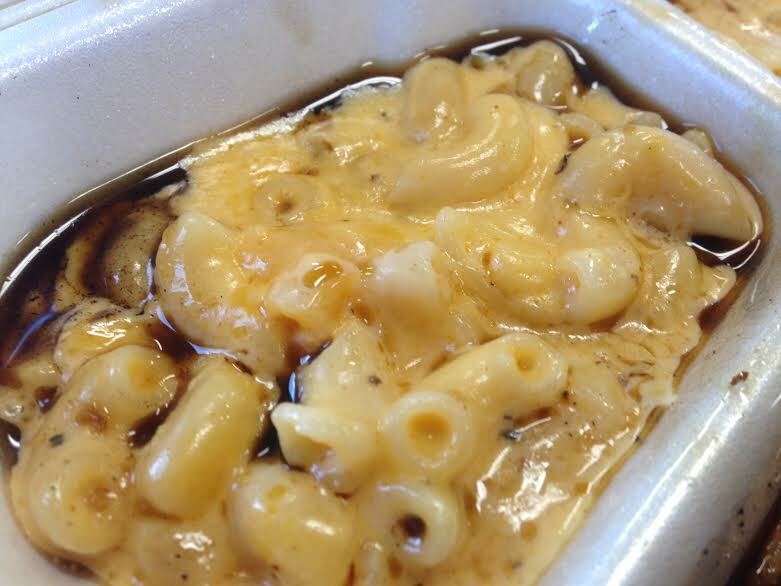 The macaroni and cheese was what my inner child has been searching for all these years; each creamy bite was oozing with a delicious blend of three different cheeses. My only regret is that I didn’t order more. For such a great meal, I would not have thought twice about paying upward of twenty dollars, but the chicken and two sides came up to just under ten dollars. This is a great deal for the caliber of food you’re paying for. Georgean’s has successfully cooked its way to a very fond place in my heart.